Who can use these Standard Terms & Conditions for Construction Work ? Any business submitting a quote for building work to a potential client and/or supplying the terms and conditions on which the work will be carried out. 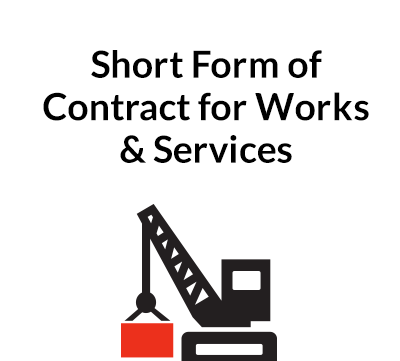 What are Standard Terms & Conditions for Construction Work for? Our document comprises a Form of Quotation and some plain English Terms and Conditions. A contractor will use them when submitting a proposal for construction or building work to a client. The contract will be effective once the quotation is accepted by the client. What are the main issues for a contractor when preparing Standard Terms & Conditions for construction work? Priee A contractor will price a job on the scope of work that is either supplied by the client or prepared by the contractor. And be sure to include some contingency. Payment terms Usually there will be a weekly or monthly invoice for the work done in the week/month and there may be an advance payment to cover cost of ordering materials etc. 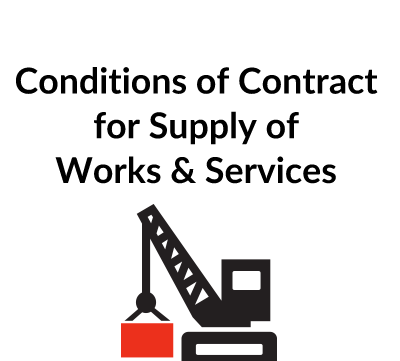 Late payment will attract interest and/or allow the contractor to suspend work or cancel the contract. Client duties Giving the contractor access to the site, getting planning & other consents etc. Variations As clients do not always have a fully detailed specification and they often want changes to the work, the contract needs a mechanism to allow the contractor to vary the cost and timing of the job to deal with these. Timing A proposed date for start of work on site and for completion, plus a procedure for adjusting these to deal with any delay caused by the client or other external events. Handover & Defects Terms allowing for defects appearing in a 6 or 12 month period after completion to be rectified by the contractor and a limit on the contractor’s overall liability. 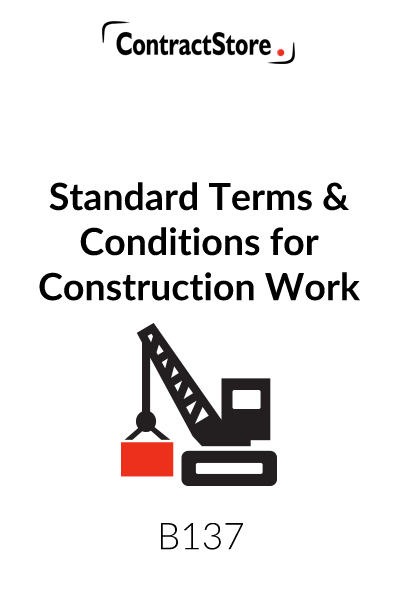 What detailed terms do these Standard Terms & Conditions for Construction Work contain? There are 6 pages of Terms & Conditions in 11 clauses plus the form of Quotation which will contain details of the work, price etc. a general clause detailing notices, assignment, subcontracting, the scope of the agreement, amendment, representation, severance and waiver. Together, the documents will create the construction contract. While fairly balanced, the documents are designed from the contractor’s perspective. 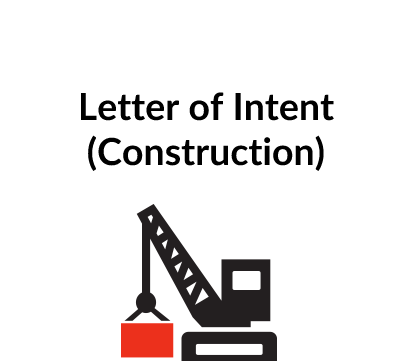 You need this document if you are a contractor submitting a quotation for construction work to a client. Yes. You can buy it once and use it in your business for each job on which you submit a quote or use the Terms & Conditions. All ContractStore’s templates are in MS Word. As well as filling in the details – scope of work etc., – you can issue the quotation on your company letterhead as well as alter or add to the Terms & Conditions as you wish. Designed from the Contractor’s point of view, these standard terms and conditions are intended as a template for any contractor who is engaged in the business of providing construction or engineering works, especially when the works are to be carried out on premises of the Client. These terms and conditions are intended to be used with a Quotation submitted by the Contractor to a Client and a form of Quotation is included. The Quotation needs to be completed by the Contractor, and the Terms & Conditions plus other relevant documents – Specification, Drawings, Contract Price breakdown etc. – sent to the Client. Two signed copies of the Quotation should be sent and the contract will only be formed when one of them is returned to the Contractor, signed by the Client. If the Client wants to change anything, it may be necessary to have another Quotation signed incorporating the changes. To avoid later disputes it is advisable for both parties to be very clear as to the detailed scope of the works and the price – vagueness in the specification is more likely to result in disputes. 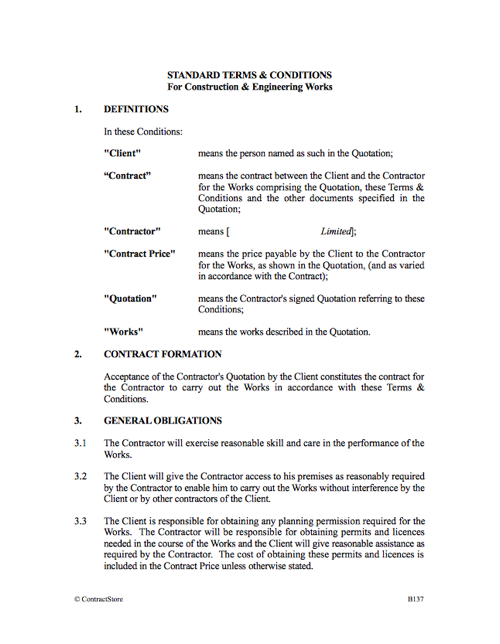 As indicated above, this refers to the Contractor’s Quotation and contains some other relevant definitions. This is intended to make it clear how the contract is formed – i.e. by the Client accepting the Contractor’s Quotation. In practice, if the Client produces his own form of contract and/or suggests changes, legal advice may be needed. This clause contains basic obligations on the part of the Contractor to exercise reasonable skill and care, with an obligation on the Client to provide access to premises. Planning permission and other licences are also dealt with here. This is designed to ensure that if a Client asks for a change, the Contractor will be paid for it at an appropriate rate. Also, a variation can result in a change to the contract period and this is covered by clause 4.2. It is advisable to ensure that all changes are confirmed in writing. We have produced a Change Confirmation Form that you may find useful – document B155. This refers back to the Quotation to a large extent but, in case the Quotation does not cover everything, there is provision for monthly invoicing. The Client must give notice if he has a reason for not paying an invoice. Also the Contractor has the right to give notice to suspend the work for non-payment. These are statutory rights in the UK. The wording of this clause is designed to comply with legislation that regulates the method of making payment under construction contracts in the UK. See our free document Z146 for more details. The clause also refers to the Contractor’s right to claim interest on late payment. The statutory interest entitlement under commercial contracts is 8% p.a. above Bank of England base rate. If the client is an individual and not a business, the Act may not apply but the wording covers this situation. This will need to be tailored to the particular circumstances but, except where works are carried out in an existing building (see clause 6.3), the Contractor has primary responsibility for works insurance and public liability insurance. This refers to the planned commencement and completion dates in clause 7.1 and allows for the Contractor to get an extension of time if he is delayed by reasons beyond his control under clause 7.2. Under clause 7.3 the Contractor gets the Client to inspect the works before handover and then the Contractor advises the completion date. In accordance with the usual practice in the UK, under clause 7.4 the Contractor has responsibility for remedying defects in the work and the period is usually 12 months following completion, but it could be less. Problems that are not due to the Contractor, such as fair wear and tear, are specifically excluded. Under clause 7.6, it is made clear that the Contractor’s liability is limited to remedying defects during the defects liability period and the clause aims to exclude any other liability of the Contractor to the Client. Legal advice is recommended here as the wording of limitation clauses may need to be adjusted to take account of particular circumstances and there is also legislation designed to protect consumers against unfair terms. It is quite common for a contract to contain a clause whereby the contractor becomes liable for liquidated damages – i.e. a fixed daily or weekly amount – if he is late in completing the works. No such clause is included here. This clause contains a three stage method of resolving disputes – first, direct negotiation, second a reference to adjudication and, thirdly, the courts. Adjudication is a legal right to any party to a construction contract in the UK and there is generally a 28 day period within which the adjudicator must reach a decision – much quicker and cheaper than court proceedings. If, however, the adjudicator’s decision is objected to by one of the parties, the dispute will eventually to the courts for a final decision. There is information on adjudication in the Free Information section of our website. Sometimes the client will make materials or equipment available to the contractor for incorporation in the works and this clause says which of them is responsible for those materials before they are used. Note: In the UK there is legislation that applies to contracts for “construction operations” within the UK. Broadly speaking, this covers all contracts involving building operations, whether new buildings or maintenance or repairs of old buildings, within the UK. The main exception is construction work for residential occupiers. The Act contains certain mandatory provisions relating to payment and adjudication as a means of resolving disputes and this contract is compatible with the law. Details can be found in the Free information on our website – document Z146.